My daughter has just started 3d puzzles. I thought this would be fun for her. The price was great and I knew it would be a challenge. Come to find out the puzzle was pretty difficult. It took 3 of us 3 days to get it together. I wouldn't suggest anyone under the age of 12 work on it. This is in my opinion an expert level puzzle. 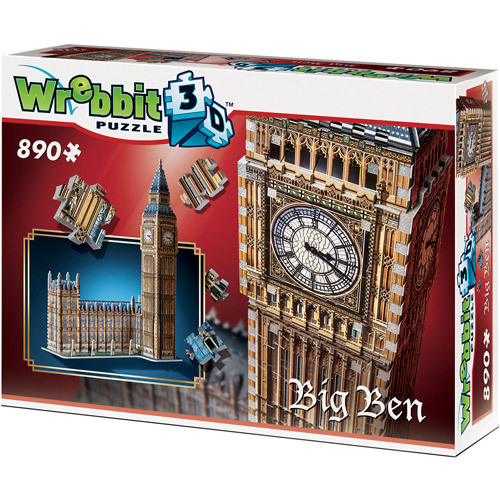 Tbook.com crawls the web to find the best prices and availability on 3D Puzzles and related Toys products like Big Ben 3D Puzzle: 890 Pieces. For this page, related items include products we find that match the following keywords: "3D Puzzle" at our vendor partner Walmart. Big Ben 3D Puzzle: 890 Pieces is one of 94 3D Puzzles and related products listed in the Toys section of Tbook.com If you have any questions on this product, please give us a call at 734-971-1210 during the hours of 9am - 5pm EST for assistance. Thank you for shopping at Tbook.com, the Internet Department Store!